My love affair with Charles and Ray Eames began when I moved to Boston in 1996. I moved to the city sight unseen and only knew one other person. This friend generously allowed me to stay with him until I found my own place. He was a designer by way of Art Center, working for a technology company in Cambridge, and living in the North End. One evening, while we were deep in conversation about design (or, more appropriately, as he was opening my eyes to the incredible world of design), his eyes lit up and he said, "You have to watch something." He slipped a cassette into the VCR titled, The Powers of Ten, and I was hooked. I finally, finally took the time to watch the recent Eames documentary, Eames: The Architect and the Painter. Many of you warned me that I would love the movie, and you were so right. I loved the film for all the obvious reason you might suspect - an in depth, behind the scenes look at the inner workings and life of Charles and Ray Eames. However, the movie made me realize that there was so much I didn't know about the design duo. I always assumed that Charles and Ray were a two-person team, but in fact the Eames studio, located in Venice, California, was a collaborative work studio that employed many designers, all designing products under the Eames name (a cooperative, [wink]). Charles actually collaborated with Eero Saarinen on the first molded plywood prototype. After many failed attempts and one finished piece that couldn't be effectively manufactured, Saarinen scraped the project. 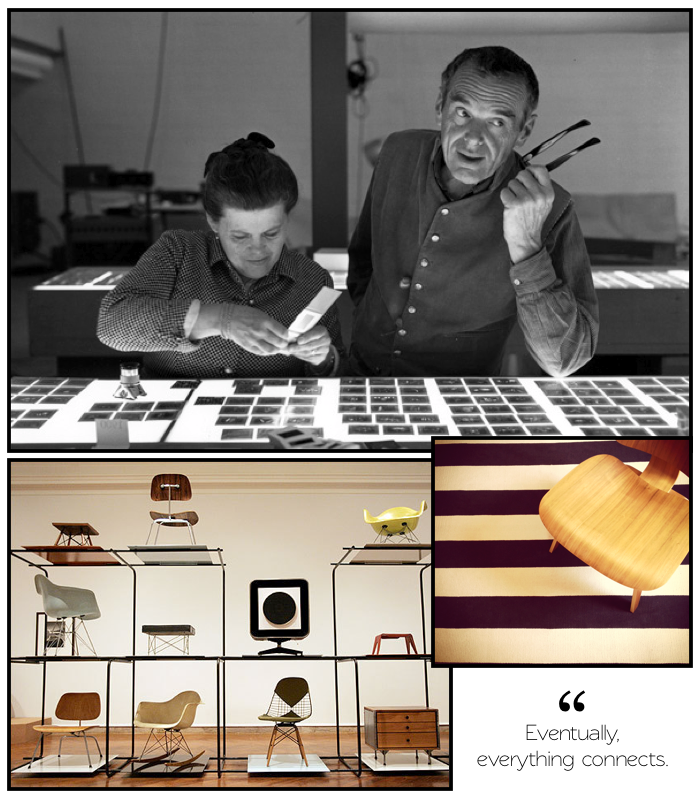 Not until Charles met Ray, and with the help of other designers in the Eames studio, was the molded chair completed, which is still in production today. Throughout his successful design career, there were many in the industry that wanted to label Charles. Was he a designer? Was he an architect? Was he a film maker? Charles didn't see himself as a specialist, but as generalists who was constantly curious about the world around him. There is so much more I could share about the movie, the creative journey of Charles and Ray Eames, and the Eames studio, not to mention the brilliance that was Ray Eames. However, at the risk of writing a short story, I will simply (and quite aggressively) encourage you to watch the film. It will move you and inspire you. Tell me, do you have a favorite designer? the Eames office as Jeannine Oppewall put it. Have a great week Theresa! Both quotes in here -- the one by Richard Saul Wurman and the closing quote by Charles Eames -- need to be tyopgraphic prints on the walls of my office. 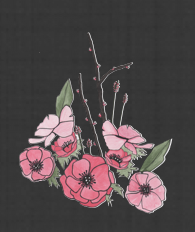 What a neat and formative story - thanks so much for sharing. These two were truly a Dynamic Duo. I share Nina's sentiments... would not have cared to be exploited AT ALL! It's like someone saying to me.. would you like to work for Apple for a while but you have to take a cut in your salary:)) Err, let me think.... I'm not a fan of full-time employment but would do a 3-6 months stint! You know I loved the documentary and can't wait to buy it when it will be released. This post just reminded me of something.... I can't divulge too much but a dear friend got me a copy of a specially commissioned Missoni documentary they made for a previous exhibition. :)) I haven't had any time to watch it but will do so right now.. I went 8 times to see the exhibition, partly due to this film. hello theresa, it looks really interesting! i have to say i've studied more fine art history than design, so this film would be educational. thanks for the review. joy and happy new week! I love what Rooth said about humility. Really, really nice. Context is so interesting isn't it. We were at a restaurant with my mom a few months back and all the chairs were Eames inspired. My mom was not impressed. "I didn't like them in the 50s and I don't like them now." (She actually has exceptionally good taste.) And "Eventually everything connects." Wow. Love this. E.M. Forrester wrote "Only connect." in Howard's End...and I used that quote as the jumping off as the artists statement in my first photography show. For me, everything is about connection. Nice to see it expressed here. Sigh, the Eameses. No wonder you named you daughter after this amazing duo. Can you imagine how inspiring it must've been to be in that relationship on a daily basis? They completely changed an industry and did so without hubris or expectations. They are certainly role models & muses! I love, love, love the quote "Take your passion seriously." It's so easy to let those things take the backseat.